What's this? 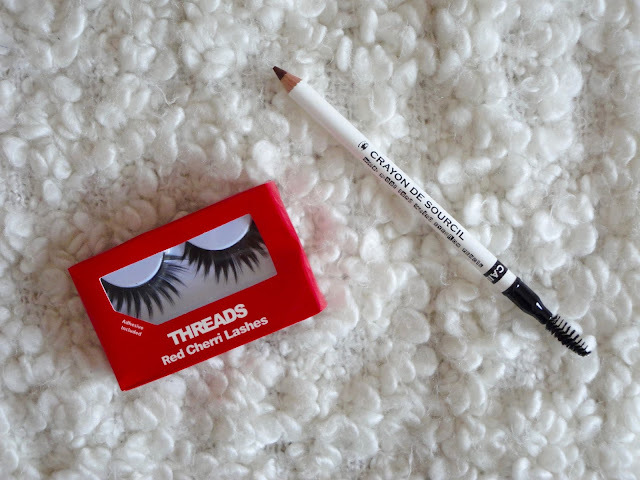 Threads Beauty is an up-and-coming brand, currently available at Harvey Nichols. They currently sell lashes, brow pencils, hair colour and eyeliners. When they contacted me to see if I'd like to try out some of their products, I was definitely up for it! As a self confessed false eyelash lover, I was eagerly awaiting which style I would get to try - I got the Red Cherri lashes, which are a very bold spiky lash - quite different to other lashes I've tried but I couldn't wait to try them! I also got the Brow Pencil in Brown, which claim to be sweat and water proof. Where do I get it? As I mentioned, they're available at Harvey Nichols in London, many locations in Ireland and you can also buy directly from them online here. The lashes are £9 and the brow pencils are £15. Swatches? Unfortunately, I don't have any swatch pictures! I did, however, use the lashes for a night out recently - you can see them in this Instagram picture. The Pros... I really really loved the style of the lashes. They were quite bold for me, but I loved how the look turned out. They stayed on all night (although I didn't use the glue it came with, I used my trusty Duo glue) and I think they made my eye makeup more night-out appropriate. The brow pencil - although it's not really a match colour-wise - is a nice balance between being soft and hard, so application is really easy. As a slight side note, I absolutely love the spoolie on the end of the pencil as it does a great job at shaping my brows and brushing them through nicely - random I know! The Cons... My main con with the lashes would be that the band is quite thick and not very flexible, which did make application a bit fiddly. If you're used to lashes like me, you shouldn't have too much of a problem - it took me a couple of gos to get them to sit nicely on the eyes, but if you're a false lash newbie you might have to look for something with a thinner band. Threads may have lashes with thinner bands, but as this is the only style I've tried I couldn't say! The thicker band also means that liner is a must with these lashes, but that's totally fine by me anyway as I'm rarely without my winged liner! As for the brow pencil, unfortunately, it's just not a colour match for me at all. The colour is much too red for me - being blonde, I tend to go for a brow product that's almost grey in colour so it looks a bit more ashy and matches nicely to my brows. However, I'm definitely going to be giving it a go as an eyeliner, I'm eager to see if the colour will last on my waterline since it claims to be waterproof! What do you think? Let me know if you've tried either of these products, and what your thoughts are in the comments below!